What are Mars’ moons made of? Where did Phobos and Deimos come from? Phobos and Deimos, Mars’ two small moons, were initially believed to be the result of interplanetary kidnapping. Many moons in the solar system appear to be captured objects, and the featureless reflectance spectra of Phobos and Deimos hint that they might be D-type asteroids. However, captured objects tend to have highly eccentric orbits, and both Phobos and Deimos orbit Mars in a nearly circular fashion. More recently, it has been proposed that both moons are the result of a massive impact 4.3 billion years ago—instead of being captured from interplanetary space, they could coalesce from the debris disk generated by the impact. Past research has shown that the masses and orbits of Phobos and Deimos can be explained by this method. This theory could also explain the presence of Borealis basin, an extended low-altitude region spanning Mars’ north pole, which can be seen in Figure 1. Figure 1. Topographical map of Mars. Borealis basin is the low-lying (blue) region in the northern hemisphere. It encompasses many officially-named regions, such as Vastitas Borealis and Utopia Planitia. Adapted from this image, which is made from data from the Mars Orbiter Laser Altimeter aboard Mars Global Surveyor. In this paper, the authors use smoothed particle hydrodynamics (SPH) simulations to learn more about the thermodynamical and structural properties of the debris disk generated in the proposed impact. SPH is a common method used when simulating astrophysical fluids, or systems with a large number of particles that can be treated as a fluid, like stars in colliding galaxies. In SPH (which has been detailed in previous Astrobites like this one and this one), the properties at a given location within a fluid are extracted by weighting the properties of the particles near that point using a smoothing function (sometimes called a smoothing kernel), which is often simply a Gaussian. 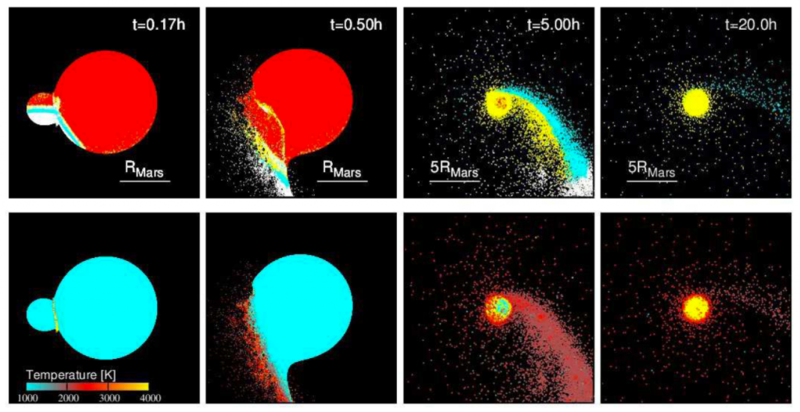 To generate a debris disk, the authors modeled a collision between young Mars and an impactor with 3% the mass of Mars. The first 20 hours of their simulation are shown in Figure 2. Figure 2. Snapshots from the first 20 hours after the simulated impact. Top row: Positions of particles over time. Red points are Mars particles, yellow are particles that fall on to Mars, white are disk particles, and cyan are particles that escape the system. Bottom row: Temperature of the particles. Shock heating in the moments after impact liquefies much of the material. Adapted from Figure 1 in this paper. The material ejected in the collision is so hot that it becomes molten, but quickly cools into roughly 1.5-meter solid droplets. The initially eccentric orbits of the disk particles precess over the next 30-40 years, resulting in a collisional torus of material around the planet. The collisions within this torus heat the material once more, again rendering it molten. Most of the material cools into 100-micron-sized droplets, but a small fraction of the silicates in the disk vaporize and condense into 0.1-micron-sized particles that can coat the larger particles. Although the solid-to-gas transition is inefficient, the process of gas-to-solid condensation generates the fine silicate particles that could be responsible for the observed, asteroid-like spectral properties. Figure 3. The cumulative fraction of Mars-originating disk particles as a function of the depth below Mars’ surface from which they originated. Beyond 4 Mars radii (solid line), there is a higher percentage of particles originating from > 50 km below the surface than in the disk as a whole (dashed line). Figure 4 in this paper. Another important finding from this work is that regardless of the angle of the impact, the disk contains material from both the impactor and young Mars. 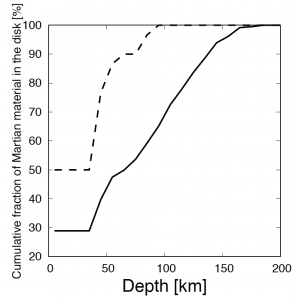 Figure 3 shows the distribution of disk particles as a function of how far below Mars’ surface they originated. Regardless of the impact angle, the disk as a whole contains at least 35% Martian material by mass. In the outer disk, beyond 4 Mars radii, this fraction rises to ~70%. What’s more, the Martian material largely comes from the mantle, about 50-150 km below the surface. This means that although the angle of impact and the radial distance at which the moons form will determine how much Mars material they contain, all formation scenarios lead to the moons being composed of a mixture of the impactor and Martian mantle. Although we currently have rovers scratching the surface, our best hope of learning about the material beneath Mars’ crust could be by studying its moons. Know before you go: How can this help future Mars missions? Now that we have some idea what to expect if Phobos and Deimos were formed from a debris disk, how can we use this knowledge? These results will be valuable for the planning of future Mars-system sample return missions, like JAXA’s planned Martian Moon eXploration (MMX) mission, which is set to launch in the early 2020s. MMX is slated to make close observations of both Phobos and Deimos before collecting a sample from one of the moons and returning it to Earth. Performing simulations like these in advance of future sample return missions will help scientists interpret their findings to learn about the origin of these two moons as well as the interior of Mars itself. Featured image: Phobos as seen by Mars Express. Credit to G. Neukum (FU Berlin) et al., Mars Express, DLR, ESA, with acknowledgement to Peter Masek. Image obtained from Astronomy Picture of the Day. I would suggest bouncing these observations off others involved in Martian science – especially MIT. The aspects of impact results may help to controversy between the isostatic and impactor camps of Martian evolution. Personally, I am in the impactor camp.